In-House Yoga Retreats are the optimum way for a person to progress in their yoga practice. Each retreat is totally transformative in itself and imbibes the energy – Shakti – and the consciousness of the particular theme of the retreat. Apart from the people who participate in each retreat being totally transformed by experiencing the theme of the retreat in themselves, the studio itself imbibes the state of the retreat and that remains for all other students who enter the room to appreciate and experience. inspiration, peace, love and fulfilment ongoing. This can only happen if the fire element in yourself is consciously activated, charged and channeled. This fire element in yourself is the element that elevates, purifies, inspires, motivates and directs. It acts on all the other elements in yourself to create balance, harmony and wellbeing. Breathing (pranayama), gestures (mudras), yoga postures, inversion machines. and then view yourself and your life holistically and positively. All of these themes make up Raja Yoga which is really holistic yoga. because it brings unity consciousness (Yoga) ongoing. Which is feeling balanced and at one with yourself and one with life. Book now for this very special event. As Rob said: Consciousness is a big word. I have finished a few books – more confused than I started. So I was excited – this retreat was to help develop the right knowledge of consciousness. Postures; direct teachings by Rob; Q and A, activities, meditations, video’s, listening to other students experiences and spending time together over meals or a cuppa. The retreat was really carefully curated so that the result for me wasn’t just more slogans for the chitter-chattering mind. It was a weekend that gave me a direct experiential understanding of the different aspects of my mind and an ability to sit in a quieter, more aware place. What a wonderful thing! Being around Rob, you know straight away he is the real deal. He’s done the work and so has that ability to distill profoundly important teachings. He shares these warmly and lightheartedly. All I felt I needed to give was to be present and open, in return I absorbed so much. I felt really supported by all the teachers and other students. You can’t control what life brings you. A few days after the retreat a good friend of mine died. I’ve felt so grateful that the teachings and energy from the retreat came at such an important time. I’ve been surprised how much was there for me immediately. I’ve been able to sit more toward my eternal self, a witness to thoughts and emotions as they’ve come and gone. “I have done a few great things in my life…. attending the Consciousness Retreat was one of them. The focus was on… well, as it is simply put, Consciousness… Over the course of the weekend, the workings of the mind were discussed and unraveled as well as what it means to be ‘conscious’ and aware. The retreat was the perfect blend of yoga poses, restorative practices, meditation, sharing food and laughter with other people, time for personal space and reflection and of course, Satsang. I am so grateful to all who contributed to creating the space and their time to Yogareal, in particular to Rob, who’s light- hearted and down to earth way of presenting an understanding of the physical postures, the mind and spirit makes yoga so accessible. The retreat was a blessing beyond words. To describe something so profound is most difficult. To have had the opportunity to submerge myself in that environment, and experience was a moment that money could not buy. For me the most challenging thing was to allow myself to be open hearted in my approach and allow the experience to happen. During the retreat a lot of fears and memories came rushing inside me. This was the perfect opportunity to put into practice what I have learnt, rather than waiting for something to happen, it happened on its own. Living in each moment to “sit back from my mind”. Even though I have heard this many times from Robbie and read many books, until I faced this and put it into practice what I had learnt and moved passed and beyond my mind. Staying in the space of self, only then something clicked and shifted inside me. 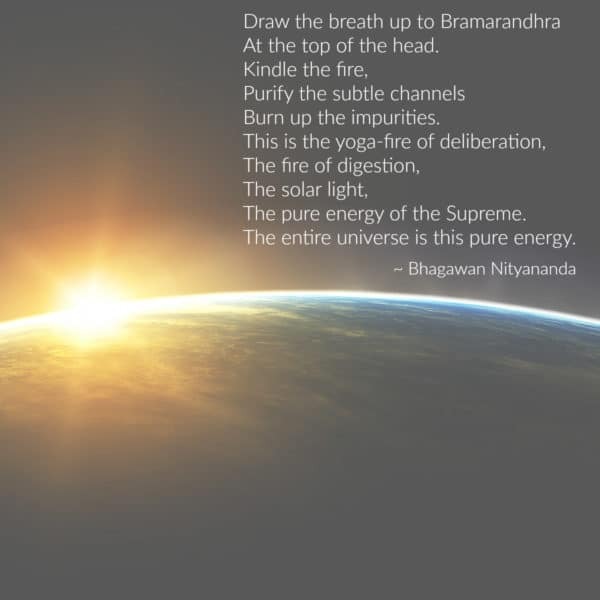 On that Saturday night while I was fast asleep Baba Muktananda walked through my dream looked at me and smiled. He was so radiant and full of love this is a very special moment I will cherish. 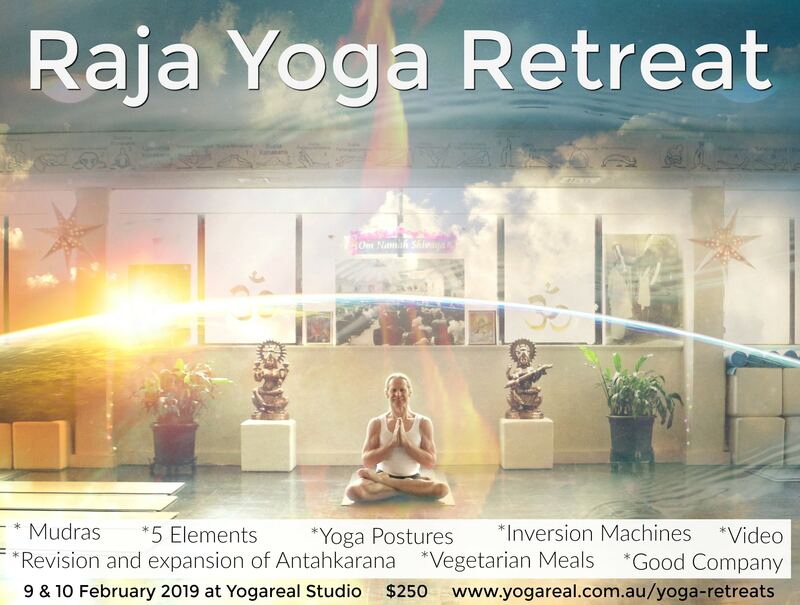 YOGAREAL RETREATS – THE WAY TO PROGRESS IN YOUR PRACTICE OF YOGA.